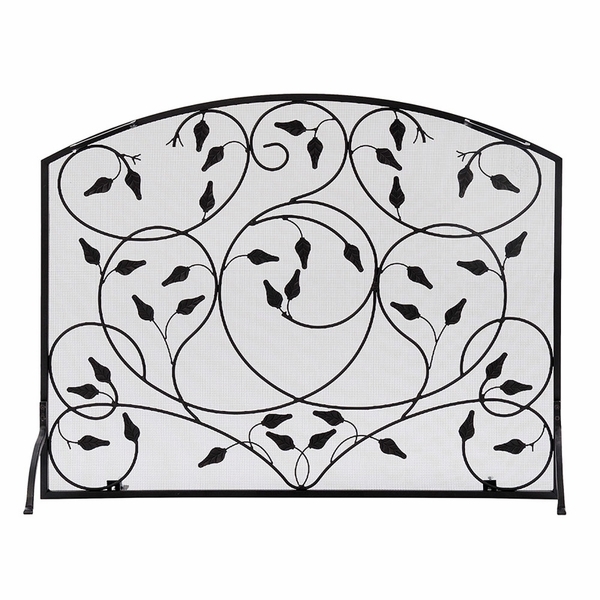 The filigree leaf design on this gorgeous fireplace screen creates a charming and natural woodsy touch to your indoor or outdoor fireplace. Choose from the flat screen which has two feet to hold it steady or the three-fold style. The tool set is also decorated with the leafy design and is sold separately. The special ergonomically designed three-pronged tongs have a "T" handle for moving and lifting logs or kindling with ease. The black matte finish in this woodsy theme will enhance contemporary or traditional style decor. The woven mesh screen will adequately protect your hearth area from flying sparks. What is the depth (thickness) of just the screen without the legs? What is the height at each end of the arch? The screen without the support legs is only 7/8 of an inch in depth, with the arch dropping to approximately 26 inches at the far edges. What are the screen's dimensions? Per the manufacturer, this item measures 38 inches wide, 29.75 inches tall, and has an 11.5 inch leg projection. Screen arrived with only half of the attachments and screws needed. Once they arrived, we have been very pleased with it. The feet are adjustable so that it can easily be leveled. This screen is very attractive with or without a fire burning in the background.